Smile Brilliant CariPro Toothbrush Review + Coupon Code! I'm so thrilled to be collaborating with Smile Brilliant again to review their new CariPro electric toothbrush. Last year, I reviewed their in-home teeth whitening system which I absolutely fell in love with. I saw incredible whitening results, and ever since our collaboration, I always recommend their teeth whitening system to all of my clients. I think having whiter teeth is always a good idea for your photos so when Smile Brilliant asked if I would be interested in testing out their brand new electric toothbrush, it was a definite yes from me! For the last 10 years I have used an electric toothbrush, so I knew I would be able to give their new toothbrush an honest, thoughtful, and thorough review. Over the years, I have used the Oral-B from Braun with rotating brush heads. I loved how it got my teeth really clean but hated the cost of the replacement heads - so expensive! Last year, I purchased the battery operated and portable Quip toothbrush but I wasn't happy with the results. I always felt that I had to re-brush my teeth within a few hours and they never truly felt clean. Ultimately, I went back to Oral-B and put my Quip away. When the CariPRO arrived, I will admit I was a bit skeptical. The brush head didn't rotate and there were a lot of settings but I set it up in my bathroom and gave it a fair chance. Soon after my first use, I knew that I had found my new electric toothbrush. Yes, it's true, I LOVE the CariPRO!! It gets my teeth unbelievably clean and whiter each time I brush. It vibrates 7x faster than any other electric toothbrush leaving my teeth cleaner for longer amounts of time. It's so fast that when I have to rinse, I actually have to shut off the CariPRO because water ends up all over my mirror. Gah, it's FAST!! The verdict? I have been using the CariPRO for over two months and I can definitely say that this is the BEST electric toothbrush I have ever used and I will be recommending to to all of my friends, family, and couples. It's an affordable electric toothbrush that truly makes your teeth super clean and whiter. Love that! Want to get your hands on one? I'm so excited to share that Smile Brilliant has graciously offered to give my readers 20% your purchase of the CariPRO. Just use the code BROOKLYN20 at check out. HOORAY!! PSSST - If you want to get their amazing in-home teeth-whitening system, you can still use my code BRKLYNVIEW20 to save 20% at checkout. Enjoy!! Social Media has been a dominate topic of conversation ever since it started to impact small business owners. It's how our customers find us, interact with us, contact us and ultimately (and hopefully) hire us. I will admit that I didn't really understand the power of social media until a few years ago and have since put in a lot more effort using it to grow my wedding photography business. I thought I'd share my social media tips with the biggest platform I use, and know the most about, Instagram. I am in no way an Instagram expert but I do feel strongly about these 3 tips for wedding photographers who are using Instagram. Link Your Pages: Facebook owns Instagram (if didn't already know that) and you will be able to easily link your instagram account directly to your Facebook Business Page. You can share your feed in both places, respond to messages and reply to comments from inside Facebook. Contact Buttons: Your profile will now display the Call, Email and Directions buttons directly above your feed. This is so helpful because viewers will be able to easily contact you with a click of a button, making it much easier and faster for potential clients to contact you. Analytics: This is probably the BEST feature of being a business account. After you've converted your profile, Instagram will start to track your engagement on your posts and within a few days you will be able to see your statistics. This is the most useful and priceless information to creating new content, crafting your ad's and engaging with your audience. Swipe Up - The rumor is that sooner or later ALL business accounts will receive the coveted Swipe Up feature from Instagram. As of today, you have to have 10k followers or more have this feature activated. I will 100% honest, I'm dying for this feature and hope Instagram would share it with everyone sooner rather than later. No. 2 - Plan Your Feed & Have A Plan - Social Media can actually become very stressful. It's hard t come up with new content everyday so I recommend planning your feed & content a few weeks at a time and all in one day. For myself, I sit down at my computer and plan my feed two weeks at a time twice a month. How do I do this? I created a Instagram cheatsheet for myself. I made my own grid with nine squares and in each square I put in a topic I wanted to discuss. For my wedding photography business, my grid will consist of photos of Brides, Grooms, Bridesmaids, Engagement Photos, Motherhood, Maternity, Babies, Photo Tips, Tea with Jainé and Personal Posts. Knowing what I'm going to be talking about takes all the stress out of planning because now that I have a plan, I can map out my grid quickly in advance and not stress about what I'm going to post. How do I plan my grid? I use Planoly to plan my Instagram account and use their Auto Post feature which is amazing. It's such a time saver! There are other applications to use such as Later and Iconosquare which are different software options. I encourage you to do a trial of each software and pick the one that best for you. Quick Tip: Every few months I will go back into my old wedding, engagement and style shoot galleries and pull content from my archives. There is absolutely no rule about what you can post and how old or new it is. If it's relevant to your business and you can write good copy, I say use what you've already have. No.3 - Advertise - I hate to break it to you but the days of instant success and gazillion followers on Instagram are O V E R! So, instead of complaining about it, you can use Instagram to your advantage play the game. I'm NOT recommending paying likes or followers (honestly, it's so bad if you decide to do that and everyone can tell when your account isn't genuine) but investing some of your marketing budget in Instagram Ad's is going to give you a very good ROI. First off, you have to remember that Instagram is F R E E. You do not have to pay to join, use their application, interact with people and potential book couples from Instagram. Instagram is a very big way that my clients find me and I happy to advertise on Instagram. Advertising on the biggest platform that couples are spending the most time and paying amazing low advertising rates, is an incredible way for you to get your name out there directly to your potential couples. Also, you have to keep at it. You simply cannot create one ad and then give up. You have to see what works and what doesn't. You'll be able to see the analytics from each advertisement so moving forward you can make an even bigger impact or adjustments. For myself, if I see that one of my photos is really doing well with a lot of likes and comments, I will promote it because I know it's connecting with my followers. Most recently, I booked a fantastic couple who saw my Instagram Ad. They saw my ad, liked the photo and visited my profile, checked out my work, contacted me and ultimately hired me to capture their wedding day. I think I spent around $30 dollars on that ad to run for a few days and it was worth every penny because my couple is amazing and the exact client I am hoping to book. I can't recommend Instagram Ad's enough! So what about you? What do you love about Instagram? Do you have any features or applications you'd like to share? Please leave us a comment below and I hope this article was helpful! One of the most common questions I receive is "what lens do you use?" and "what is your favorite lens to use on a wedding day?". I thought that this would be a great topic to discuss on the blog and over on my Instagram IGTV channel. I use several lenses throughout the course of a wedding but I definitely have my favorites and must-have lenses. I've listed each lens below including why I love it and how I use it for each part of the wedding. Oh, and I should mention that I do not use zoom lenses. Yep, you read that right. From the compression, higher aperture's and slower speeds just do not work for me in my own wedding photography. I prefer prime lenses for their speed, low light capabilities, and overall sharpness. They are, however, VERY expensive and unfortunately there is no way around the price of prime lens so if you can find a good one used, I say grab it while you can! I hope its helpful!! Let's start with my all time ride or die lens - the 50mm 1.4. I absolutely love the 50mm focal length because it's as close to our own eyes as possible. I love that there is no distortion and the perspective is exactly how we see it. It's very flattering on our faces and bodies keeping everything as natural as possible. I have two 50mm's but the one that spends 95% of the time on my camera is the 50mm 1.4 Sigma Art lens for Nikon. This lens is simply the best 50mm out there in my humble opinion. It's unbelievable sharp (which I actually turn down in post-processing) and is a true workhorse. I purchased this lens 3 years ago and it hasn't left my side since! I photograph everything from the details, getting ready, bridal portraits, bride and groom photos, reception details, wedding toast and speeches with this lens. However, when I do get to the reception, I will switch out the heavier Sigma lens for my lighter Nikon 50mm 1.4G. This lens is so small and light that it's perfect for receptions when my back starts to ache from running around all day. This lens has zero distortion or vignetting (dark shading at the corners of the frame) which is exactly why I prefer the 50mm lens to any other. Also, the 1.4 aperture allows me to shoot very wide open and let in a lot of light in low light situations like wedding receptions or sparkler exits. This is hands down my number ONE recommendation for any wedding photographer looking to build their gear kit. 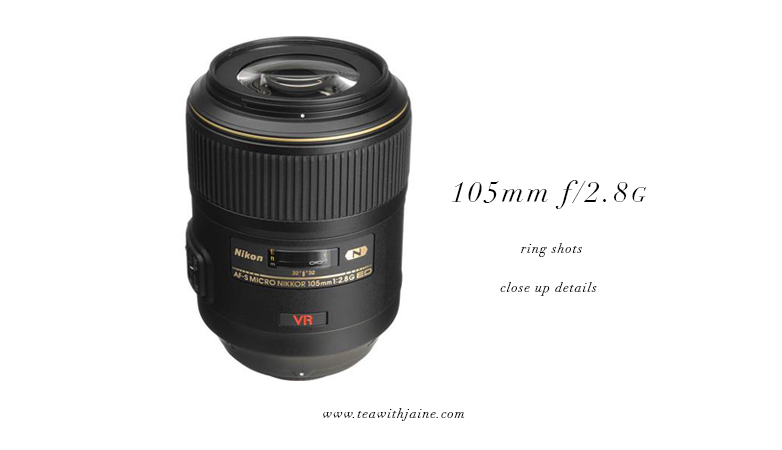 It's a must-have, can't live without kind of lens for me! the 35mm 1.4 Lens is a fantastic wide angle lens that has very minimal to no distortion on the edges of the frame. The 35mm is the perfect lens for those tight hotel rooms or stunning ceremony locations. I will use the 35mm for getting ready photos in small hotel rooms. I always use this lens for clean wide ceremony photos just after the bride and groom have walked down the aisle. This is the perfect time to take a few stunning wide photos of the ceremony space with everyone seated so the couple can remember what it looked like. The 35mm is great for large bridal party shots and always on my camera body for family formals. Especially, the extended family! This lens is great for cocktail hour photos when asking guests to smile for the camera. Last, I will use this lens for the first dance, father-daughter/mother-son dances and speeches/toasts to include more of the reception room in the photos before switching to a tighter lens. When guests are eating, I like to include a few ambient photos of the space so the couple can get a full sense of their wedding venue during their reception. I think it's a nice way to add to more photos into their final wedding gallery. I will put the 35mm away after the last toast and switch it out for a wider, lighter lens. (see below). 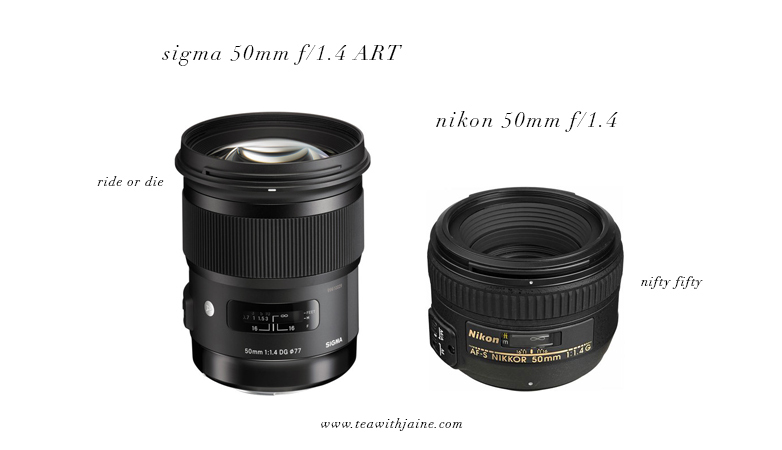 A less expensive option, would be the 35mm 1.4 Sigma Art Lens for Nikon. the 85mm 1.4 Lens is a beast! She is perfect for getting in close without being noticed and still has the power and speed of a prime lens. I use the 85mm during my engagement sessions when we are just starting and couples can be a bit nervous. I'll walk away and give them an action to do and capture them from afar so they can start to get comfortable. I like that I can get a close up shot without being directly in front of them. I love this lens for wedding ceremonies and getting close up reactions from family members, the bride and groom and wedding guests during the service. It also produces the prettiest bokeh (blurry background) in the photos. I always use this lens during the reception for couples first dance, parent dances, speeches and toasts. It's just the right compression with no distortion to create a beautiful photos capturing real authentic moments. I will say that it's incredibly HEAVY (all that glass!!) and once the last speech is done, it's put back in my rollie and it's finished for the night. The 105 Macro 2.8G Lens has just one purpose in my gear collection. It's for ring detail shots and ring shots alone. It's an expensive lens for just one thing (I KNOW!) but it's worth every penny to make those epic ring shots for your couples. I manually focus this lens around f/6.3, f/8, or even f/11 to created a incredible detail shot of the rings. Since it's a macro lens, the compression and depth of field are still extremely low at higher apertures BUT shooting higher lets you get the prongs, diamonds, engravings in focus each and every time. I do manually focus this lens because the autofocus is just a waste on a macro images. I usually get very low to my subject (the rings) and take my time manually focusing my shot. I'm usually sweating at this point during the detail photo process because of all the concentration I have to do to nail the foucs. It's not a pretty sight!! The 28mm 1.8G Lens is perfect for wedding reception dancing photos! I purchased this lens a few years ago when it was released from Nikon and boy, do I LOVE it! It's so little, light and the perfect wide angel lens for getting in close on the dance floor and capturing all the action. I'm usually in the middle of the dance floor (I have several bruises to prove it!) with the 28mm capturing really fun wide shots from the heart of the party. There is some distortion on the edges of the images but that is to be expected with such a wide lens. I'm ok with this look during the reception but only at the receptions! It's a prime lens which means it's still fast in low light situations (ie. candlelight dinners, receptions) which is exactly why I prefer this lens to a 24-70mm 2.8 Zoom. In my opinion, it's just too slow and doesn't open up wide enough to let in the pretty ambient light I love for my style of photography. My back loves this lens too because it's so light and easy to carry around for several hours during the reception. The 135mm 2.0 Lens sits in my bag 95% of the time throughout a wedding day. Since I do not use zoom lenses, I needed a lens that had a longer focal point past 85mm but was still sharp enough to create great images. I found this 135mm Lens from Nikon used and it's amazing for ceremonies where I'm not allowed to be in the first few aisles. Some churches have very strict rules about where the photographer and videographers are allowed to be during the actual ceremony, so having this long prime lens in my kit is definitely handy in those less common situations. It's a 2.0 aperture which is just fast enough to let in a lot of light if needed in a dark church or synagogue. Usually, I have already spoken with the facility director and know what my limitations are for the ceremony space, so I already know if I need to dust off this lens and use the day of my wedding. It's a great long prime lens to have "just in case" I need it and I always like to be prepared. I do, however, love when my second photographer has a 70-200mm for the ceremony to get in nice and tight to the Bride and Groom or reactions from the guests. It's a great addition to the couples overall wedding gallery but not a lens I'm going to purchase anytime soon. And finally, I also use the Black Rapid LensBling Caps on each of my lenses so I can quickly see which lens I'm reaching for inside my Shootsac or Thinktank Rollie. They are so helpful and by the end of the night, I can never find any of my front or rear lens caps. It's the truth!! So, those are MY favorite lenses. What are yours? I'd love to hear from you jn the comment section below. Am I missing any amazing lens options out there?! Stay in the know! Subscribe to our newsletter, podcast, join our facebook group and be sure to follow brklynivew on Instagram for the latest Tea with Jainé IG TV episode! As I was preparing for my first wedding of the season, I thought it would be a good idea to show you exactly what I carry and wear to every one of my weddings. These are things that over the years as a wedding photographer, I know I need to function and work efficiently throughout the course of the day. These are simply my must have tools and I hope you find these tips helpful! 1 - Shootsac Lens Bag and Shoulder Pad - I absolutely could not function without my crossbody camera bag. It carries my lenses, batteries, memory cards, lip balm and much more... I've had a Shootsac from the very beginning of my wedding career and highly recommend it. It's made from scuba material so it's very soft and comfortable on your body. There are six pockets (3 on each side) that allow me to carry all of my gear. I usually will have 3 lenses on me - two in the Shootsac and the one on my camera - at all times. I also created a system by dedicating specific items to certain pockets because it can also become a "black hole" where everything and anything will get lost :) I would strongly suggest buying the additional Shoulder Pad to keep the bag comfortable on your shoulders throughout the day. The crossbody strap is adjustable and I wear it at hip height to easily switch out my lenses and grab my memory cards. If anything, this is my MUST HAVE item for every single wedding photographer out there. 2 - Memory Card Holder - I always have my memory cards on my person the entire course of the wedding. I never want them to get out of my site and chance being lost or stolen. I bought one a Think Tank Pocket Rocket to clip securely on to my Shootsac and I can easily pull out the pouch and switch cards in a hurry. Quick Tip: Every time I change my memory card in my card pouch, I turn it backwards before tucking it away in the pocket. This way, I can visually see that it's been shot on and will reach for another card when I'm in a hurry which is all of the time on a wedding day! 3 - Lens Cloth Clip - I like to keep a lens cloth on me at all times and love this clip on lens cloth from Nikon. I also use the Zeiss disposable lens wipes (not pictured) throughout the day. I usually by a box each of 100 each wedding season. 4 - Extra Batteries for my Camera & Flash (not pictured) - I use the Storacell Battery Caddy to organize and store my AAA batteries. These great plastic caddy's hold my loose batteries all in one spot. I put one in my bag at the start of each reception just incase my flash dies in the middle of the dance floor. I also keep an extra set of batteries for my digital and film camera's in my Shootsac as well. You never want to be in the middle of session or important moment and have your camera turn off because you are out of power. I always like to be prepared! 5 - Portable Phone Charger (not pictured) - It's no secret that I like to story on my Instagram (hey, this is how all of this happened, right?) so I carry a small portable iPhone charger. I like this Anker Portable Phone Charger in white. Also, I feel as if you can never find a power outlet inside the reception venue so it's a good idea to have your own. 5 - Ear Plugs - I started wearing earplugs during receptions because I damaged my right ear at a wedding several years ago. I walked past a huge speaker during the ceremony and caught a loud sharp sound in my ear resulting in a damaged ear drum. I had to go to the Dr.'s and after a few tests, he said my ear drum was damaged and would heal on its own. I had a bit of vertigo for almost a year but it eventually went away. Now I always wear earplugs and have several pairs on me at all times. 7 - Wedding Photography Timeline & Pen - I always have a printed copy and working pen on me throughout the day. This also helps get through family photos very quickly because I can start right away since I already have the list on me. Smart!! Saving time means that your are saving money and I'm all about saving money, especially when it comes to your business!! Over the years, I have discovered some amazing software applications that have significantly sped up my wedding photography workflow and I wanted to share my top three resources with you. I hope they help you in your business or spark an idea on how to streamline your own workflow! No. 1 - 17 Hats (Client Management Software) I put off upgrading my "system" of how I managed my clients for a long, long time. How long? Embarrassing long! I was using several different apps from Apple (iCal, Mail, Notes, Pages and Numbers) to keep track of my inquires, weddings, booked sessions, invoices and expenses. It was becoming very overwhelming and I would wake up in a panic because I wasn't sure if I had crossed all my "T's" and dotted all my "I's". With a in-depth demo from one of my closest friends, I began to see the light and 17 Hats was about to become my main squeeze. I decided to tackle setting up my client management software in January (a relatively slow time for wedding photographers) so I wouldn't be rushed or in the middle of a deadline. I watched several "how-to" video's, made some emergency texts to my friend, and within two weeks, I was ready to go. I easily integrated 17 Hats Leads Form into my website and I can now track all of my new inquires. I created several workflows for each type of session I photograph and setup my calendar to sync with my iCal (sorry, Apple, I can't quit you ;) My questionnaire's are finally easy to use and I can eventually use 17 Hats for my invoicing and billing but I'm not there just yet. Baby steps... 17 Hats has made my life so much easier and way more efficient that I want to kick myself for taking so long to do it. So, take my advice, if you have more than 5 weddings a year, offer mini-sessions, photograph a ton of families, look into a CRM that is right for you! 17 Hats was the easiest for me to setup myself. I tried Tavé (too difficult) and I've heard wonderful things about Dubsabo. I should mention that 17 Hats is not perfect and missing some features from their competitors BUT they are implementing reporting soon, which is really my biggest complaint. However, you can easily export your data and make your own reports using a pivot table (PIVOT! Hello Ross Gellar Fans ;) so for myself, it wasn't a deal breaker. I signed up at the end of the year with a full two year subscription when they were running a promotion which saved me money! Oh, and if you use my referral link, you will save 10% OFF your year subscription. No. 2 - Planoly - Oh, how I love Planoly, let me count the ways! Instagram is one of the biggest and best tools for my business. It's how I get my work out there the fastest, interact with clients, vendors, viewers and just about ALL of my couples. However, using Instagram can feel like a full time job and figuring out your grid layout can become challenging. It's a visual tool so it really does need to look visually pleasing. Enter Planoly! A cloud based visual planner for Instagram. It's amazing and so easy to use. It's a paid service ($84 per year) and you can schedule, plan, and post all of your images. Recently, Instagram allowed third-party applications, such as Planoly, access to Auto-Post images directly to your feed without your approval. For me, this was a game changer! I love being able to schedule & auto-post my images in advance. I do, however, have to go back in and tag images with locations, vendors, and clients because you cannot automate that process but since I'm on Instagram every single day (let's be honest!) it's not a big deal. There are other Instagram programs you could use - Later is free - but it's really what works best for you. Also, you can use several of Planoly's other features such as shopping links, reporting and analytics. So fancy!! No. 3 - Calendly - This might be one of my all time favorite applications ever! Calendly is a cloud based online scheduler and it rocks my world! Why do you need an online scheduler? Because scheduling phone calls with potential couples can take forever trying to find a date and time that works for everyone. It can also be very frustrating for the couple and I want to make things as easy as possible right from the beginning. By using Calendly, I send out a link to my calendar that has my availability for the next two weeks. Next, the Bride can easily see when they are available to chat and choose a date and time that works for them. Last, they click the time, book the appointment and I get an email confirmation - BOOM - we are all set!! I have to admit that once I implemented this system into my New Inquiry process my meeting rate increased 10 fold. The best part, Calendly is FREE for the first calendar. They offer upgrade features that you can pay for (email & text confirmations) or you can simply leave it as is with one event type and keep it free.